[Brittliv] made the mistake of getting her friends into Nerf weaponry, and so began the race to mutually secured destruction via foam darts. She may have the upper hand in this war, because her Nerf Vulcan sentry gun is both incredibly powerful and is able to be operated autonomously with a webcam featuring a friend or foe identification system. The azimuth and elevation mount for the gun is made out of plywood, with each axis controlled by a single servo attached to an Arduino. Of course a stock Nerf gun would be fairly boring, so [BrittLiv] increased both the voltage going to the gun’s motor and the strength of the gun by replacing a 2kg spring with a 5kg spring. Targets are tracked with a webcam using Processing and a bit of code from Project Sentry Gun. One interesting feature is a friend or foe tracking system; if the gun sees someone wearing a t-shirt with the Instructables logo, the target is identified as a friend and is not brutally mowed down with plastic darts. [JP] built an Arduino based magnetic card reader. It uses off-the-shelf parts but if you don’t mind buying the components this will get you up and running in no time. If you want more info there’s also this Teensy based version. With exams behind him [Adam Greig] had time to make a Nerf sentry gun. It’s actually quite easy to pull everything together. He’s got a netbook running Motion, an open source motion sensing program for use with a webcam. 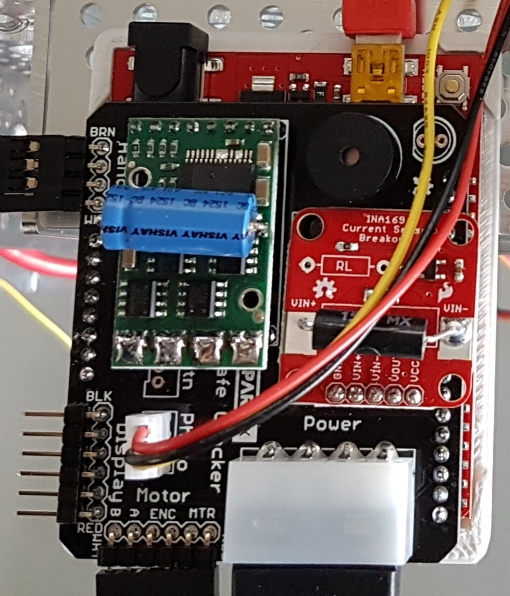 When movement is detected an Arduino, connected via a USB cable, actuates a servo to pull the trigger of the gun. The turret itself has seen a battery upgrade that increases the firing speed. It’s fun to see hardware prototyping done with a few pencils and a fist full of cable ties. Check it out after the break. 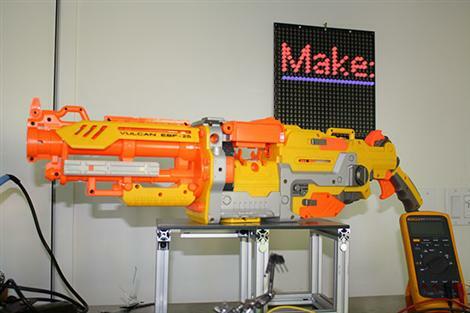 This particular toy, the Nerf N-Strike Vulcan, has become quite a popular starting point for turrent projects. We’ve seen one that uses a motorized base, and another that was part of a final project at Cornell. [John Park] is documenting his build of a Nerf Sentry gun. So far, he’s rigged the trigger and set up the motorized base. He’s documenting the process in fantastic detail with great photos along the way. If you want to see what it will be like when it is finished, check out these other Nerf sentry guns that we’ve featured in the past. Reader, [Ben Godding], sends in the video for his senior design team’s automated paintball sentry. The frame is made of plasma cut aluminum. The paintball gun uses a custom hopper mounted remotely from the gun body. It has two webcams offering a 160 degree field of vision, and the image processing is done by a dual core pentium CPU booting windows xp off a compact flash card. The computer interfaces with the 1/4scale RC servos using a PIC24. The paintball sentry can either be configured via a computer GUI when a monitor is available or a baclkit keypad and 4×20 charachter display in the field.